If you are looking for information on the Doc Popcorn franchise business opportunity, Doc Popcorn franchises or Doc Popcorn franchising, then you have come to the right place. Choosing to join a franchise system is a significant decision. Choosing to join Doc Popcorn is one that will change your life! We invite you to explore the amazing franchise opportunities we have to offer within Doc Popcorn's rapidly expanding franchise system. We're certain once you've experienced our way of life, you'll understand the Doc Popcorn difference. Our franchise family, 'Doc Poperators', are the cornerstone of our success. We have built our organization around one of America's most popular and enjoyable snacks. Add our proprietary blends of all natural delicious flavors and ingredients, and we are talking about a smile that goes ear to ear. Doc Popcorn offers the secret recipe to build a business that fits you and your family by providing amazing, all-natural popcorn that makes you the star of your own enterprise! The flexibility of our concept allows you to operate your business when and where you want, literally. You can even pop one of our mobile operating units - The Doc Popcorn Catering Unit - in the back of your car and take it on the road! "Doc Popcorn created a 2x year over year increase in popcorn sales...having a high quality brand freshly produced at the stadium was a win-win for the Denver Broncos and Doc Popcorn, and was enjoyed by fans." Doc Popcorn is the only franchise that offers authentic, fresh popped and deliciously flavored popcorn with no artificial ingredients. It's an easy, affordable system that takes the guesswork out of starting and running a profitable business. We celebrate lives by embracing the values of family, harmony and balanced living, and abiding by the principles of sustainable living - all while having a blast and making a living doing it! Marketing materials and advertising collateral provided - assistance to promote and drive your business. The 'Doc is always in' helpdesk - get all your questions answered 7 days a week. Efficient turnkey process - Depending on the model you choose, our real estate development team has a systematic approach to streamline the process and shorten the build-out time so you are making money as quickly as possible. Build your business as big (or small) as you wish: You can create a Doc Popcorn experience at a local community event or large venue in a collapsible catering unit (which you can pop right into your large car or van, or tow on a trailer), just 3ft x 5ft using a Doc Popcorn mobile PopCart, or have a PopKiosk or a full blown PopStore in as little as 40 square feet. 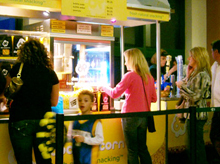 Mobile PopCart or concession PopTrailer - events and catering. 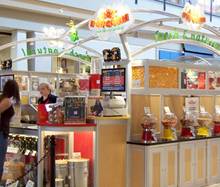 Retail: PopStores or PopKiosks in mall locations, lifestyle centers, airports, stand alone, drive-thrus, office buildings, stadiums, music festivals and more. Operate a single cart, or build your business with multiple units. You choose how big you want to be! What are you waiting for - get popping! We are looking for entrepreneurs who are independent, self-disciplined, persistent, hard working and confident. At the same time you should be fun and outgoing! If you feel you are a good fit to join the Doc Popcorn family, and want to get started on your path to freedom and flexibility, just complete the form below and you will be contacted. "Grab the opportunity to take control of your life in a way you have only dreamed of before and, in doing so, empower yourself to make a good living and have a blast all the while!"